Since the 1980s, the Landesgartenschauen (Regional Garden Exhibitions) have been held every two years in North Rhine-Westphalia. Apart from being a showcase for those involved in the design of gardens and green spaces, the aim of the exhibitions is to enhance and provide a lasting contribution to the towns in which they are held. In 1998, the town of Oelde was chosen for theLandesgartenschau in 2001. The garden exhibition took place after only a short period of preparation and succeeded in attracting the most visitors to any such exhibition in North Rhine-Westphalia up to that point. Planning was centred on already-existing green spaces – the old municipal park, numerous allotment gardens and two cemeteries. The Auensee in the south of the 44-hectare exhibition ground was recreated and the Axtbach (Axt stream) was renaturalised. In the central section, the old municipal park and the water mill underwent extensive modernisation. The mill pond was extended to create a mill lake with an island while “Kramers Mühle” was converted into a children’s museum called “Klipp Klapp Kindermuseum Oelde”. The already-existing allotment gardens and cemeteries were redesigned as themed gardens. The three main areas – “idyllic floodplain” in the south, “romantic park” in the centre and the “magical gardens” in the north are linked by an approximately 2.5 kilometre route. The area was renamed the “Vier-Jahrezeiten-Park” (Four Seasons Park) and still remains an attractive destination for outings long after the end of the official garden exhibition. In 1929, a Volkspark (People’s Park) and a small botanical garden were created on the meadow bordering the Axtbach (Axt stream) in the south-east part of Oelde. This is the best-known and largest complex in the town. The initiator of the park was the then town mayor Hermann Johennig, who is remembered today by a commemorative stone at the park’s centre. 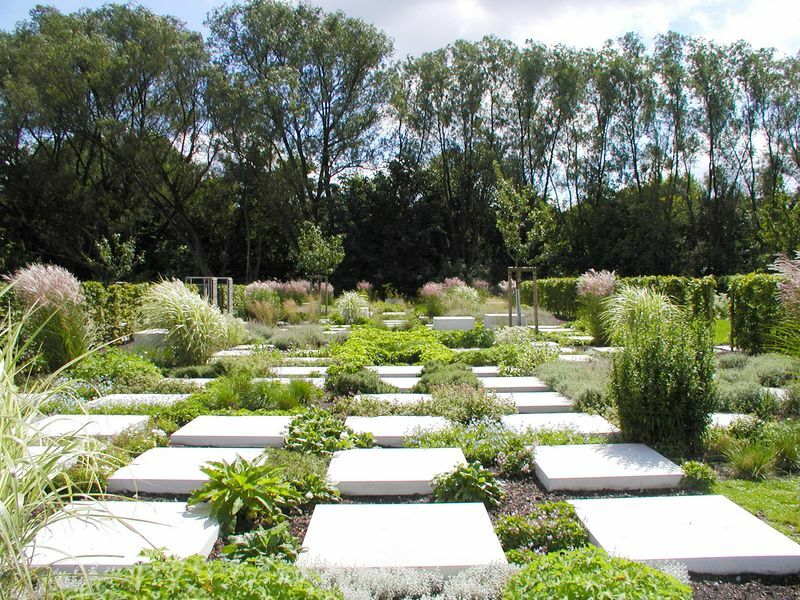 The model for the approximately nine-hectare park, the design of which features landscape elements and geometrical forms, was the municipal park and botanical garden in Gütersloh, which had been created a few years previously. Paul and Walter Roehse, the well-known Gütersloh tree nursery owners and garden architects, were commissioned with creating the paths and planting the trees and shrubs in the park in Oelde. Among its features are an old water-mill with a mill pond supplied with water from the Axtbach as well as an open-air swimming pool, which was opened in 1912. At the end of 1998, the town was chosen for the Landesgartenschau (Regional Garden Exhibition) in 2001. After only a short period of preparation, plans by the Düsseldorf landscape architects Bödecker, Wagenfeld & Partner were used to stage the garden exhibition, which succeeded in attracting the most visitors to any such event in North Rhine-Westphalia up to that point. Planning was centred on already-existing green spaces formed by the old municipal park, numerous allotment gardens and two cemeteries. In accordance with the local implementation of Agenda 21, the aim of the plans was to involve the local population in the design of the park and to fulfil certain requirements regarding its lasting use. The Auensee in the south of the 44-hectare exhibition ground was remodelled and the formerly channelled Axtbach (Axt stream) was renaturalised. In the central section, the old municipal park and the water mill underwent extensive modernisation. The mill pond was expanded to create a larger mill lake with an island open to visitors while “Kramers Mühle” was given a glass extension and converted into “Klipp Klapp Kindermuseum Oelde”, a children’s museum. The already-existing allotment gardens and cemeteries in the northern area were redesigned as themed gardens. This was a particularly popular area of activity for the local Agenda 21 groups. Artistic advice for the project was obtained from Otmar Alt, the well-known designer, painter and graphic artist from Hamm. With “Blütenzauber & Kinderträume” (“Flower Magic and Children’s Dreams”) as its motto and the support of professional advertising and marketing, the Landesgartenschau succeeded in attracting 2.2 million visitors, making it the most successful garden exhibition up to that point in North Rhine-Westphalia. 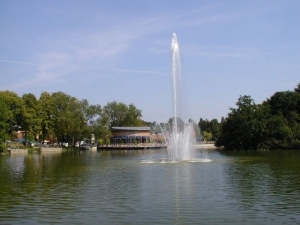 The park was renamed the Vier-Jahreszeiten-Park (Four Seasons Park) and remains an attractive place for outings long after the end of the garden exhibition. The three main areas – “idyllic floodplain” in the south, “romantic park” in the centre and the “magical gardens” in the north are linked by an approximately 2.5 kilometre route. In the centre of the mill lake, the “muse island” is home to impressive bamboo plants and is also worth a visit. The children’s museum “Klipp Klapp” in the enlarged old water-mill is a special attraction which is unique among North Rhine-Westphalia’s museums. The museum, which has a playful and experimental approach to the element of water, is especially geared towards children and provides them with the opportunity to explore the old mill’s functioning and operational processes. The park itself also has several unconventional playgrounds, above all for younger visitors, which are attractive destinations for a variety of recreational activities. Alongside the gardens, which feature extensive plantings of spring flowers and shrubs as well as changing displays of seasonal plants, the park provides a wide variety of opportunities for recreation and leisure long after the end of the garden exhibition. A newly erected outdoor theatre seating 1,500 people is available for large open-air events. Hence the activities which were begun during the garden exhibition are still continuing today and the newly erected and converted buildings have been given useful functions. As envisaged in the idea of lasting use, the park will continue to be an attractive recreational area in the future which draws visitors from the local region and beyond. Daily from 9.30 a.m. – 7 p.m. The main paths are suitable for people with limited mobility.